Robometricschool. 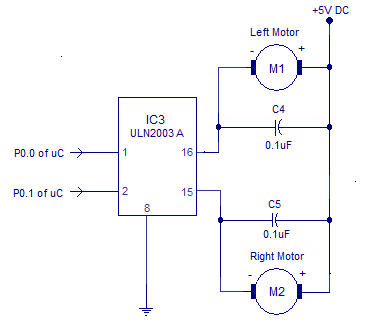 - There are many using of driver DC motor in electronic design. When we want to design robot like line follower robot we must also prepare DC motor driver circuit schematic that can run effectively. In this time we want to show you electronic circuit schematic of Driver DC Motor that using Integrated Circuit (IC). This IC that used is ULN2003A that also familiar in electronic market. We think this is the simple electronic circuit schematic for Driver DC motor. The main component of this circuit is IC ULN2003A like in figure 1. ULN2003A is a high current (500mA), high voltage (50V) darlington array consisting of seven darlington pairs with common emitter and open collector. Out of the seven channels available in the IC,only two are used here. One for the left channel and one for the right channel. The operation of ULN2003 is very simple to explain. When a particular input line (say pin 1) is made high the corresponding output line (pin 16 goes low) and vice versa. And then Capacitors C4 and C5 isolates the remaining parts of the circuit from the electric interference produced by the motor. The back emf voltage produced when motor is switched and the voltage spikes due to arcing of brushes mainly accounts for the above said electrical interference. These capacitors are very essential and without them you can expect sudden crashes from the microcontroller side.